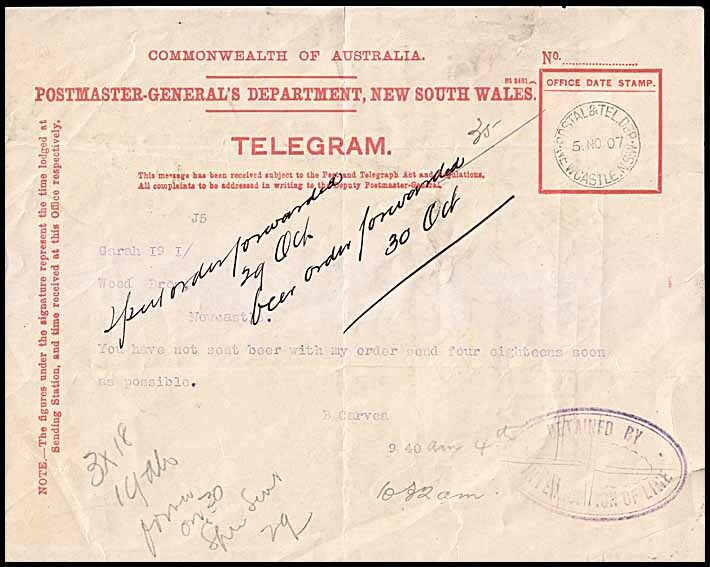 New South Wales - Interim period: 1900-1917. Standard Interim period format for heading above TELEGRAM. Colours (text & form): Light red on pale yellow. Size of form overall: 170 × 213 mm. Size of datestamp box: 38 × 38 mm. two lines of text under TELEGRAM. Stores number with one arc to left of Date Stamp box. Previous NSW Interim delivery form (NI-DO-4). Next NSW Interim delivery form (NI-DO-6). Overview of NSW Interim forms.